Truth be told, there's a shortage of snow at some of our favorite ski resorts across the country. Unless you're hitting Big Sky, Jackson Hole, Grand Targhee and Sun Valley, to name a few, you're stuck justifying a reason for hitting the slopes when there's not much to ski. And that's especially true when there's NFL playoff to be had and your favorite team is facing off for a playoff berth. Ah, but Breckenridge created a reason to ski regardless of the less than stellar conditions and the recent foot of snow--besides the obvious that regardless of the terrain conditions you're still getting in an awesome workout that hands down beats any day in the gym. In the process, Breck may be calling to a divine power for even more snow, just not Ullr, the Norse god of winter they've been celebrating all week. That lucky charm is Tim Tebow. If you've followed even an inkling of the current NFL season, you know what he's done playing quarterback for the Denver Broncos (getting them into the playoffs after a slow start to the season). As a celebration for that postseason play, Breckenridge converted into Broncoridge (yep, they even flew a flag along the ridge to display the temporary name change) and turned Tebow. 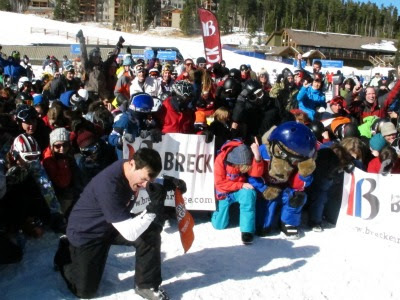 In the terrain park, they took Tim Tebow's infamous crouch and prayer (sorry, that's the best way I can think to describe it) and performed it mid-air, dubbing it "The SkiBow." I'm far from talented enough to perform that snow trick, but here's one that I can handle: The World's Largest Group "Tebow" on the snow. Even mascot Ripperoo participated, as pictured above. Sure it's a bit of a stretch to be dragging NFL action into fitness-focused Fit-Ink, but I'd like to think it works if it gets you to think about skiing for even a minute. And who knows? Maybe a little Tebow trust will bring more snow.